Elijah Hickman | Banner Riverside’s Mission Inn played the movie “My Best Girl,” March 2, a silent 1927 American romantic comedy film directed by Sam Taylor. 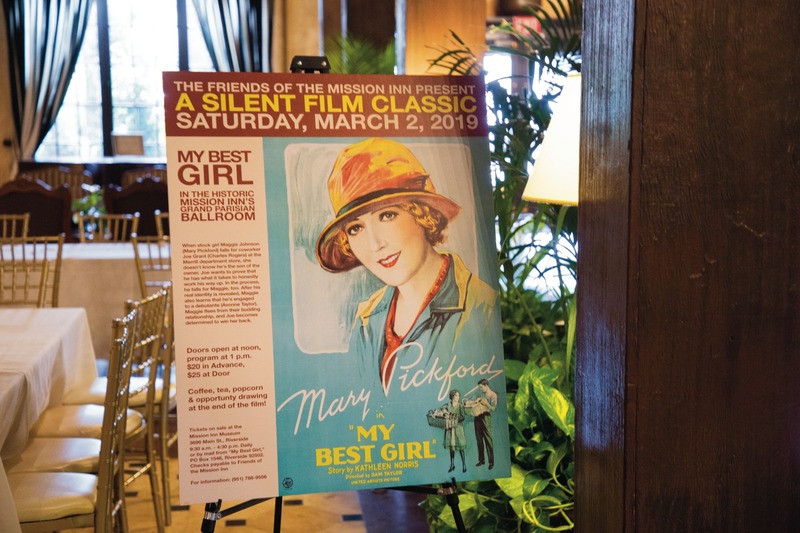 The Mission Inn Hotel & Spa began the month of March by playing host to the annual Silent Film Fundraiser to help the historic establishment raise money. The organizers of the event, Friends of the Mission Inn, is a non-profit organization whose mission is to help recover, repair and restore the Mission Inn itself. The group has been hosting the film fundraiser since 2007 after the Mission Inn’s famous Kimball Pipe Organ was restored. Sharla Wright, president of Friends of the Mission Inn, said the Mission Inn’s Kimball Pipe Organ plays a major role in this fundraiser and the organization uses the money to fund more preserving projects. “We needed a fundraiser and a major reason we have this event is because of the organ. We were looking for an event that featured it and that is why we chose these silent movies,” Wright said. “We have probably raised more than $5000 in previous years so whatever money we get from this fundraiser we use to restore more of the artifacts,” Wright said. The silent film shown was “My Best Girl” (1927), starring renowned film actors Mary Pickford and Buddy Rogers. Another highlight of the fundraiser was Mark Herman, an organist known for being an accomplished silent-film scorer, who accompanied the film by playing the music score on the Kimball pipe organ. Dr. Daniel Blair, assistant professor of American Sign Language, said silent films changed cinema for how they were shot and acted. The creation of silent films started in the late 1800s. They were popular with both the hearing and deaf communities. It was not until the film industry started to make films with sound that films started captioning for the deaf community to help them better understand the premise of films. Angelia Carrera, senior communication studies major, works as an ASL interpreter and said silent films were monumental to the deaf community. “Something we can all learn and appreciate about silent films is the use of captioning. Technology has progressed to where we can have audio-visual experiences in film, but why has captioning stopped? Deaf people have to search for specific times when movies are shown with captioning if they want to attend,” Carrera said. The fundraiser was held on March 2. This Mission Inn fundraiser is held annually so people have a chance to help preserve this Riverside landmark while also falling in love with silent films.